Elements Collection in Parker Selling Fast! Interior shot of the Grasslands model home at HorseShoe Ridge. 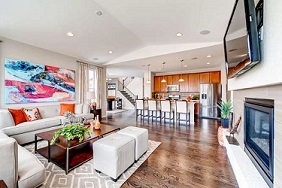 The Elements collection homes focus on open floorplans that combine livability and practicality. Amid grand opening event-filled weekends, Colorado homebuilder, Berkeley Homes, recently introduced its highly anticipated new Elements collection models at two new Parker area residential communities: Horeshoe Ridge and NeuTowne, and with 15 homes sold – 10 within the first month since opening — sales have been hot in both. Ranging from 1,883 to 2,486 square feet, the Elements collection includes ranch and two-story homes with a fresh, modern twist while reflecting a clear understanding of how today’s families want their homes to accommodate their lives. Elements collection home designs feature living spaces that are open and flowing with the idea of keeping busy families connected. Mudrooms are conveniently close to the garage, while spacious kitchen islands lend themselves to entertaining just as well as after-school snack and homework stations. Meanwhile, options like tech hubs, wine bars, studies and rec rooms are also offered in the new collection. “Parker is a great place for these new family-oriented Elements collection designs,” says Berkeley Homes’ president Jeff Willis. The town is a naturally attractive Denver metro suburban community for families of all types, especially those who desire an authentic Colorado small town feel without having to give up big city amenities like easy access to daily conveniences, transportation, healthcare, recreation, fitness, shopping, dining and night life. Parker is also ideal for families who want their kids attending award-winning Douglas County schools. “Parker offers easy access to all Colorado has to offer while still remaining close to the Denver Tech Center, the vibrant Park Meadows Shopping area, light rail, downtown Denver and a variety of other nearby amenities,” said Willis, adding, “As a Colorado homegrown builder, we have a tremendous understanding and appreciation for what Colorado families want from both a location and their home, and Horseshoe Ridge and NeuTowne both fit the bill perfectly, and it’s clear from our early sales pace that our new Elements collection is a perfect match.” Parker residents also enjoy a deep sense of community, a renowned cultural events center, authentic western attractions, a waterpark and mile after beautiful mile of parks, trails and open space. The NeuTowne community can be found just south of Mainstreet and Jordan Road while Horseshoe Ridge is east of Jordan Road and west of Motsenbocker Road. On-site sales offices are open Mondays from 1 PM to 5 PM, Tuesdays through Saturdays from 10 AM to 5 PM and Sundays from 11 AM to 5 PM. More information can be found at www.liveberkeley.com.